Back to back awards posts, both Malt Maniac related. Today, the worlds best (only?) 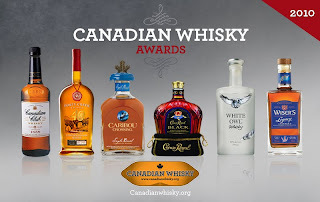 dedicated Canadian Whisky Website has announced the winners in The Canadian Whisky Awards 2010. Canadian whisky is without doubt the least respected of the world's whiskies. Crown Royal is the 4th biggest selling spirit in the world but you rarely hear anyone bragging about their recent Canadian whisky purchase. To be fair, there hasn't been much variety over the years with the big boys establishing prohibitive laws back in their heyday so there aren't as many distilleries as there could be. But recent years have shown us that the likes of Gibsons, Forty Creek, and Caribou Crossing have been attracting a modest amount of critical acclaim. And so Malt Maniac Davin de Kergommeaux has really tapped into something that has been long overdue, a conscious appreciation of Canadian whisky. When I moved to the US back in 2008 I was admittedly surprised by the availability and consumption of Canadian whisky. Most interesting was that those ordering it had no idea it was Canadian and, obviously affected by their beverage of choice, almost apologised for liking it. Weird. export market, and multiple markets. Awards of Excellence were also conferred for accomplishments in innovation, brand extension, and notable success in raising the profile of Canadian whisky in general." For more info, head over to Canadian Whisky.